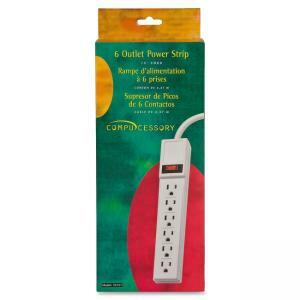 Six-outlet power strip features a built-in circuit breaker, ABS fire-retardant plastic casing, six grounded outlets, 104 joules, power switch integrated with a 15 amp overload resettable circuit breaker, mounting keyholes and an illuminated rocker switch as well as a SJT 14/3C grounded power cord. Rated at 125 volts, U.L. listed and CSA approved.